Jordan Brand created a high end performance sneaker, otherwise known as the Air Jordan 2011. A lightweight external shell makes the upper in a fashion not seen before. Patina leather (patent leather on some models) has been placed along the base of the upper, a soft and flexible Italian leather only used on dress shoes… until now. Depending on the colorway, smooth grain leather or nubuck is used on the upper portions of the shell. The shoe itself starts on the inside. An internal full length boot can be found made primarily of double layered mesh. Securing the foot in place with a full length inner boot proved to be a daunting task. Luckily reinforced nylon loops were placed along the medial and lateral sides which are connected under the foot-bed allowing the materials to be pulled and stretched around the foot perfectly. Perhaps the most unique feature of the Air Jordan 2011 is its interchangeable midsoles. Two different, purpose-built midsoles are included with the Air Jordan 2011; one caters to athletes who require speed and agility, the blue “Quick” midsole, while the other catering to explosive power players, the red “Explosive” midsole. 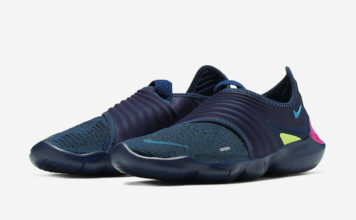 The “Quick” midsole situates the players foot closer to the ground for a more low-profile and responsive feel, and features Zoom Air units in the forefoot and heel, while the “Explosive” midsole provides more cushioning and comfort and features a ¾ inch Air unit. 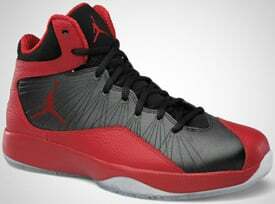 The Air Jordan 2011 is also available on NikeiD, which makes it the first Air Jordan flagship model to be available for customization by the consumer. Two team based models which come in at lower retail prices separates the Quick and Explosive aspects into two separate models. 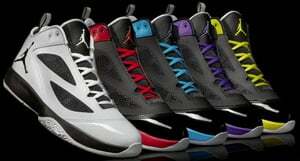 The Jordan 2011 Q Flight, geared towards Guards (Quick) and the Jordan 2011 A Flight (Explosive) which is geared towards Forwards. 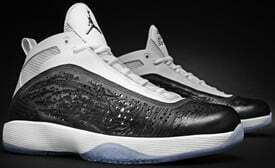 The Air Jordan 2011 was groundbreaking, being the first to use genuine Italian leathers along with being the first performance model to encompass the utilization of a modular cushion setup, completely customizable for each wearer.